Vernon, TX (January 29, 2019) – Grain sorghum production is highly susceptible to changes in climatic conditions, more so than to different irrigation regiments a producer might implement on the crop, according to a Texas A&M AgriLife Research modeling study. The results of the study, “Simulation of eﬃcient irrigation management strategies for grain sorghum production over diﬀerent climate variability classes,” were recently published in Agricultural Systems journal, https://authors.elsevier.com/a/1YL2T,70zHZLrF. Dr. Srinivasulu Ale, an AgriLife Research geospatial hydrologist in Vernon, completed the study with Kritika Kothari, a doctoral student, and Dr. Clyde Munster, senior professor, both in the Texas A&M department of biological and agricultural engineering, College Station. Other collaborators were Jim Bordovsky, AgriLife Research at Halfway; Dr. Dana Porter, Texas A&M AgriLife Extension Service in Lubbock; and Kelly Thorp, U.S. Department of Agriculture Arid Land Agricultural Research Center, Arizona. The Ogallala Aquifer Program provided partial funding for this study. Ale said eﬃcient use of irrigation water is critical for the sustainability of agriculture in the Texas High Plains. 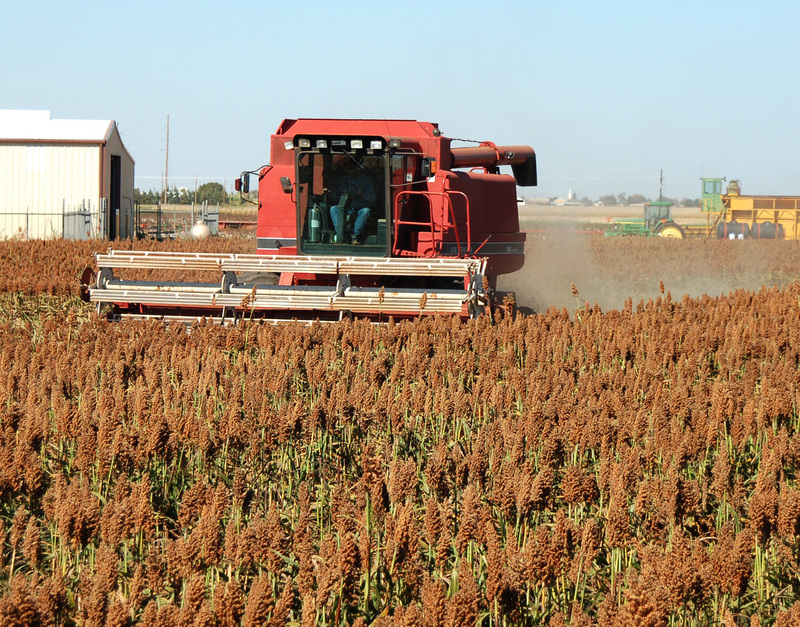 Grain sorghum is one of the major crops grown in the region, and it is known for its drought tolerance and lower water requirement compared to other cereal crops. Several irrigation management scenarios were simulated in the study to suggest optimum irrigation management decisions for grain sorghum production in the region. The diﬀerences in grain sorghum yield and water-use efficiency were greater across climate variability classes than between irrigation scenarios, suggesting that grain sorghum production is highly susceptible to changes in climatic conditions. In the study, the CERES-Sorghum and CROPGRO-Cotton modules of the Decision Support System for Agrotechnology Transfer were evaluated using data from cotton-sorghum rotation experiments by Bordovsky at Halfway over a period of nine years. The evaluated CERES-Sorghum model was then used to identify: optimum soil moisture at planting, soil moisture threshold to start irrigation, soil moisture threshold to terminate irrigation, and a deﬁcit or excess irrigation strategy for production based on simulated sorghum yield, irrigation water-use and water-use eﬃciency. Also, the eﬀect of weather conditions on simulated strategies was elucidated by dividing the long-term, 1977–2016, weather data into cold, warm, wet, dry and normal climate variability classes based on growing season temperature and precipitation. The results from long-term simulations indicated weather conditions played a key role in selecting appropriate irrigation management strategies. Simulated water-use efficiency was consistently higher in cold, dry years. This indicates the most eﬃcient use of applied irrigation water was achieved under conditions associated with less evapotranspiration and smaller amounts of excess water. Applying irrigation water to reﬁll the soil proﬁle up to 85 percent capacity was found to be suﬃcient in normal and wet years. However, data suggests it would be desirable to replenish the soil proﬁle to 100 percent of field capacity in warm and dry years. Ale said the recommendations on irrigation management made in this study were based on the magnitude and distribution of seasonal rainfall and temperature during the simulation period. The eﬀects of days with extreme hot or cold temperatures were not investigated. Also, irrigation water was applied regularly to maintain soil water content at appropriate levels throughout the season, so the eﬀect of water stress during critical growth stages also was not investigated. “Our future efforts will focus on addressing these important issues,” Ale said.